Lima, Peru -- Rev. 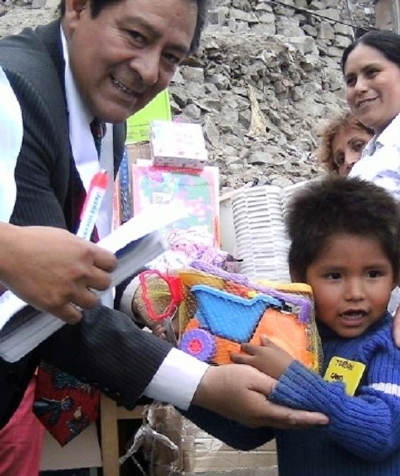 Dr. Orestes Sanchez, president of UPF-Peru 2008-09, raised funds and gathered supporters to help him bring Christmas cheer to the children in the Bayovar Canto Grande district of San Juan de Lurigancho, one of the poorest areas of Lima. On December 23, he delivered games for the children and also plastic food boxes so that they could share together the traditional Christmas "Chocolatada" (drinking chocolate and paneton cakes) in the communal kitchen that is traditional meeting place in these deprived districts. He also took the opportunity to share with the parents the vision of Rev. Moon and the Universal Peace Federation of "One Family under God." Rev. Dr. Orestes has worked continuously for peace since his appointment as a UPF Ambassador for Peace in 2005. He has visited many dangerous places in Peru where conflict existed and brought reconciliation to the often warring factions of indigenous people. In recognition of his work he has recently been appointed by the Peruvian government as an "Extra Judicial Conciliator." This title will help him continue his work in a more official capacity throughout Peru.